As the name suggests it is a disease associated with aging . This disease gradually destroys sharp and central vision which is essential for seeing objects clearly or in detail. This is because AMD affects macula (central part of retina) which has the keenest visual potential. AMD causes painless loss of vision. 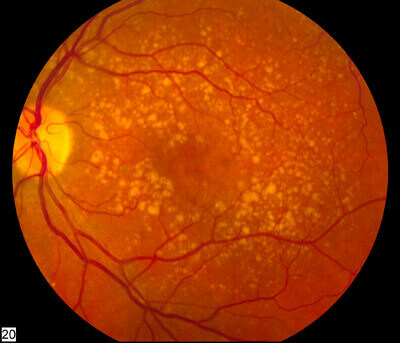 The risk for development of macular degeneration increases with age. Other proposed risk factors for the disease include smoking, obesity, family history, excessive sunlight exposure etc. In the early stages of macular degeneration the transport of nutrients and wastes by the RPE slows down. These wastes accumulate under the retina to form yellow deposits called drusen. These drusen are identified on examination. There is no proven prevention or treatment for the dry type of AMD. Patient is advised to take vitamin therapy (according to the AREDS study) and to control the risk factors. 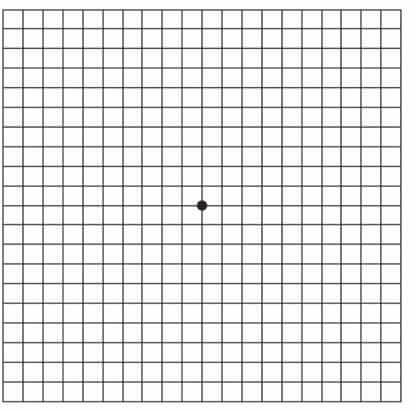 Careful self-monitoring with Amsler grid and regular examination with the retina specialist is essential as some people with dry type may progress to more severe wet type. Amsler grid: It is simply a grid made of evenly spaced horizontal and vertical lines. A small dot is located in the centre is for fixation. 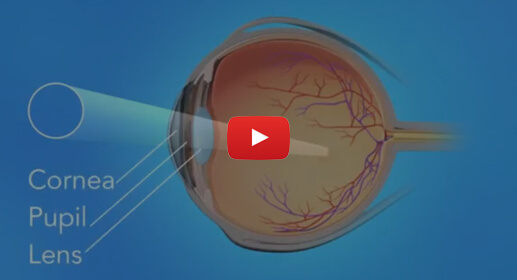 It is used to test the macula (the central part of retina) at home. -Are all the corners seen while concentrating on the central dot? -Are there any missing areas or dark areas in the grid? -Do any of the lines look wavy, blurred or distorted? It is a more severe type of AMD. In this type membrane under the retina thickens and breaks. 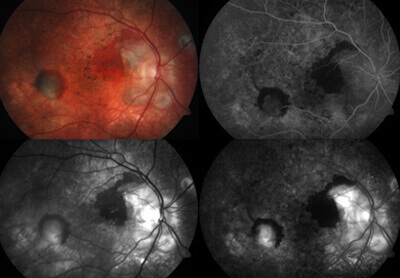 The oxygen supply to the macula is reduced resulting in the growth of abnormal blood vessels from below the retina. These new blood vessels are very fragile and often leak blood and fluid. This blood and fluid raise the macula from its original place. The vision at this stage is blurred and the straight lines appear wavy. Eventually areas of neo vascularization undergo scarring resulting in gross visual loss. - Dilated examination of the eye: Drusen, edema, bleeding are noticed at the macula by the retinal specialist. - Optical coherence tomography (OCT): This test is done to see the cross sectional retinal image which may reveal new vessels, macular edema and presence of fluid below retina. It is also helpful in assessing response to the treatment and follow up. OCT and FFA are complimentary techniques and OCT cannot replace FFA. Laser therapy: Laser is used to destroy the fragile leaky blood vessels. This is useful when the vessels are away from the fovea (centre of the macula). Photodynamic therapy: In this procedure a drug called verteporfin is injected in to the arm. It travels throughout the body including the new blood vessels of the eye. The drug sticks to the surface of new blood vessels. The drug is activated by light of a specific wavelength. This activated drug destroys the new fragile blood vessels. It is a painless outpatient procedure taking around 20 minutes time. Intravitreal Injections: An increased level of vascular endothelial growth factor (VEGF) is seen in wet AMD. This growth factor is the cause for the development of new choroidal vessels. Drugs that block the effect of these factors are called anti VEGF drugs. Drugs that are available for this purpose include Avastin, Accentrix, Lucentis, Razumab and Eylea. In one of the trials using lucentis stabilization of vision was noted in up to 95% of cases and improvement was noted in 34 % of the cases.